Approbation is full of official praise or approval of something. When you castigate someone, you criticize or punish him severely. To decry something is to speak against it and find fault with it. An elegy is a poem or other piece of writing expressing sadness, often about someone who has died. If you exhort someone to do something, you try very hard to persuade her to do it. If you fulminate against someone or something you speak or write angrily about them. A harangue is a long, scolding speech. If you inveigh against something, you criticize it very strongly. A laudatory article or speech expresses praise or admiration for someone or something. A paean is piece of writing, verbal expression, or song that expresses enthusiastic praise, admiration, or joy. A peroration is a long speech that sounds impressive but does not have much substance. If you receive a plaudit you receive admiration, praise, and approval from someone. A tirade is a prolonged, verbal outburst that severely criticizes someone or something. Geraldine believed that it was her civic duty to protest some new construction, so she wrote a diatribe in her long and angry letter to the editor of the local paper. Her strong disapproval of the land development caught everyone’s attention—such a fierce diatribe or written criticism surprised even the editor himself. Geraldine’s furious letter of protest or diatribe against excessive development influenced many other locals in the area, who filed complaints as well. Quiz: Try again! What is a diatribe? A complaint or use of words that is angry but makes no sense at all. A speech or piece of writing that attacks an idea or activity. A letter to an editor that examines an important local issue. A diatribe is a speech or piece of writing that angrily attacks someone’s ideas or activities at length. Dial a Tribe If you don't like a particular tribe, you could dial that tribe and speak a diatribe against it, all from the convenience of your own home! To level a diatribe against another person is to “thoroughly rub or pound” them with angry words, trying to drive home the point that you are very displeased. 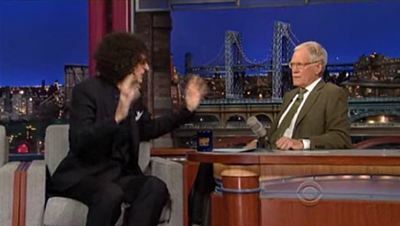 Howard Stern on The Late Show with David Letterman Howard Stern delivers a diatribe.